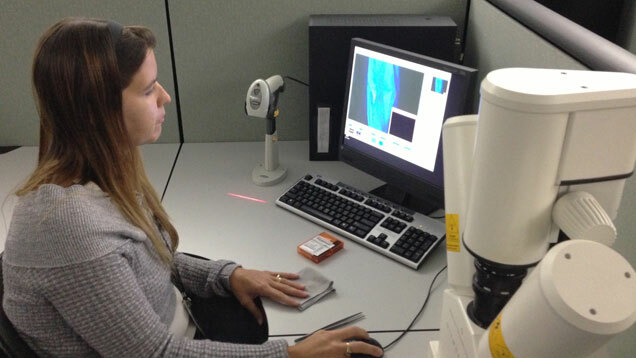 GIA research scientist Sally Eaton Magana analyzes the image of a marquise diamond in the DiamondView to determine whether or not the stone is synthetic. Photo ©GIA. One estimate by Tacy Ltd. said that more than $700 million worth of synthetics – disclosed or not – entered the jewelry market last year. De Beers, on the other hand, while not providing a dollar amount, claims that only a fraction of that figure is in the market. De Beers said it bases its opinion on the costs involved in producing both Chemical Vapor Deposition (CVD) and High-Pressure, High-Temperature (HPHT) synthetics, both of which it manufactures through its Element Six division. GIA has seen no appreciable upturn in the numbers of synthetics to its lab, disclosed or not, said Tom Moses, senior vice-president of Laboratory and Research. The controversy over undisclosed synthetics is generally focused on smaller diamonds (under 0.30 carats) that are less likely to be submitted to GIA or other gemological labs. While there is ample evidence that Fancy yellow and yellowish brown melee-sized HPHT synthetics have been in the market for some time (Gems & Gemology, Fall 2008), small CVD colorless synthetics offer very little price advantage over natural diamonds because of high production costs, according to Stephen Lussier, Executive Vice President, Marketing, De Beers Group; CEO, Forevermark who was interviewed last Spring. He believes the majority of undisclosed small CVD synthetics are by-products of large pieces created for industrial uses and believes that those turning up in labs are still “isolated examples.” CVD-grown diamonds are type IIa, free of nitrogen that can add color, which makes them useful for optics and electronics. The technology to create CVD synthetics, however, is improving, which means their numbers in the market may increase. Dr. James Shigley, GIA’s Distinguished Research Fellow, notes that recent samples he has examined show no signs of post-production treatment. Earlier CVD synthetics often came out gray colored and required costly heat treatments to improve their color. Eliminating post-treatment heat processing cuts costs considerably, but also lessens the risk of damage to the newly made stones. De Beers, Lussier said, is preparing a defense against undisclosed synthetics in the form of a mass-screening device to fast-check melee for synthetics. The unit is in testing. Earlier this month, the company reported that it had tested numerous parcels of melee on behalf of its clients and found no synthetic diamonds. One recent synthetics-sighting was in a group of 18 type IIa Fancy brown stones, ranging from 0.14 to 0.63 carats, that a dealer purchased in hopes of improving the color through HPHT treatment. The treatments were unsuccessful, however, prompting the dealer to send them to a lab for examination. The lab reported that 13 of the stones were CVD synthetics. GIA researchers continually test synthetic samples with the De Beers’ DiamondSure, which can flag all synthetics, along with some types of treated diamonds, and also a small percentage of natural diamonds. 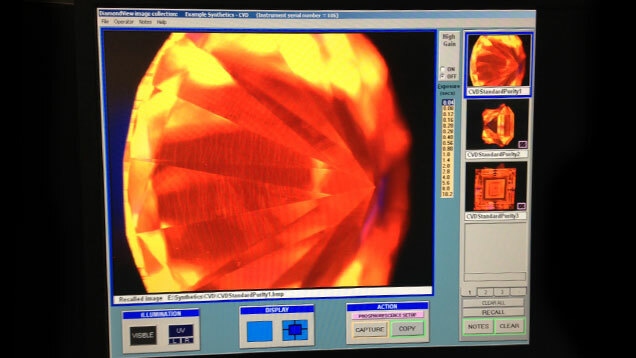 Stones that are referred by the DiamondSure as possibly synthetic have spectra collected by advanced testing instrumentation and are typically screened by the larger DiamondView, which provides an extremely detailed fluorescence image that GIA researchers use to identify whether the diamond is natural or synthetic. GIA researchers perform a battery of additional tests on all “referred” diamonds to be absolutely certain of a diamond's origin. 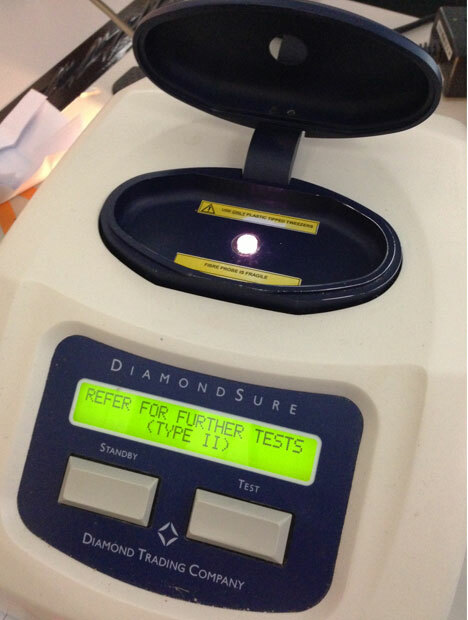 The DiamondSure is the one of the first tests a diamond will receive after submission to GIA labs. If the diamond is Type II and shows certain characteristics, the DiamondSure will refer the stone to the DiamondView for further testing. Photo ©GIA. The DiamondView enables lab staff to view tell-tale growth patterns for synthetic diamonds. The regular striations visible in the middle of this round diamond indicate it is a CVD-grown synthetic. Photo ©GIA.